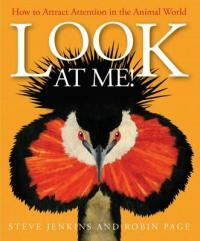 "The latest offering from the award-winning team of Robin Page and Steve Jenkins focuses on the most unique and exciting animal displays in the natural world, used by creatures to stand out. This eye-catching, high-interest material is ideal for nature lovers, Jenkins fans, and even the most reluctant readers." -- Provided by publisher. Look! submitted by Thomas B Brown on August 1, 2018, 2:02pm Some animals want to attract a mate by being flashy. Some use their color to warn of danger or poison. Excellent book. Great drawings and enough text to explain. Great for second grade science class.